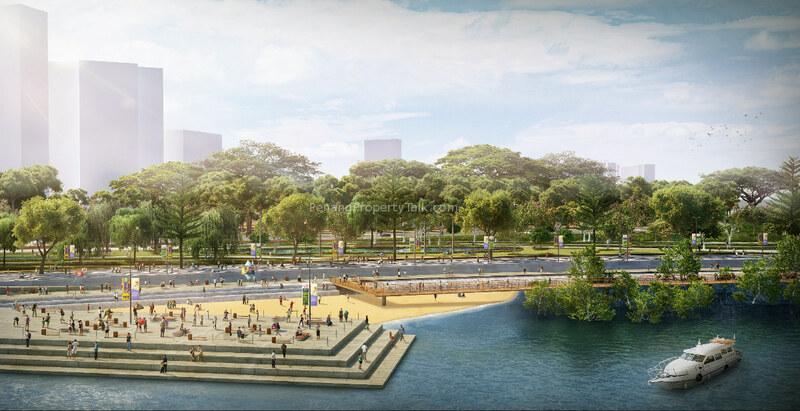 Penangites were today given a preview of the new seafront public park planned for the Gurney Drive foreshore. 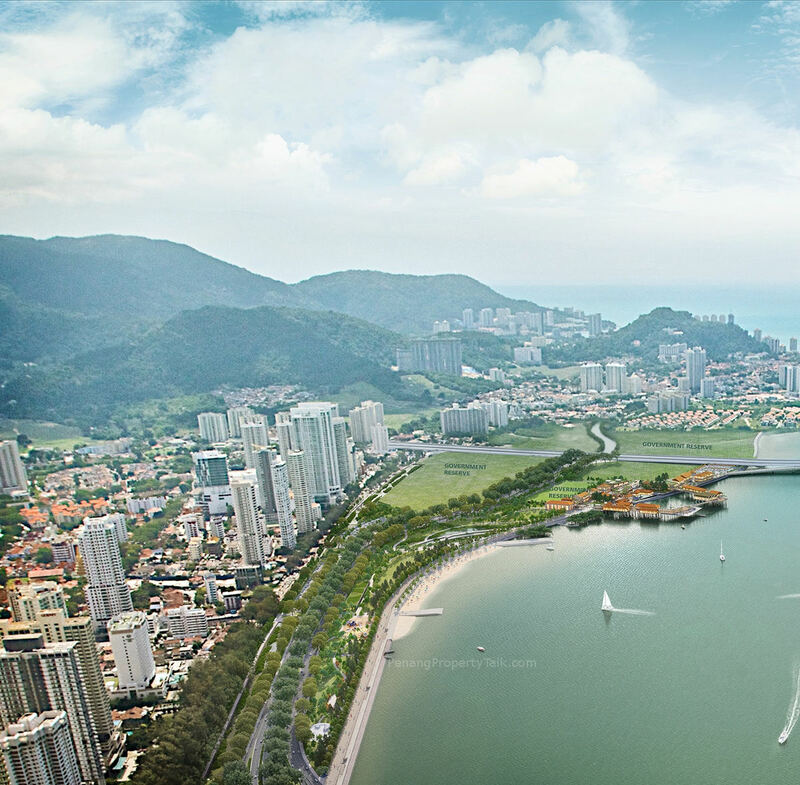 Spanning close to 60 acres, this water-fronting public recreation area called Gurney Wharf is a Penang State Government initiative. 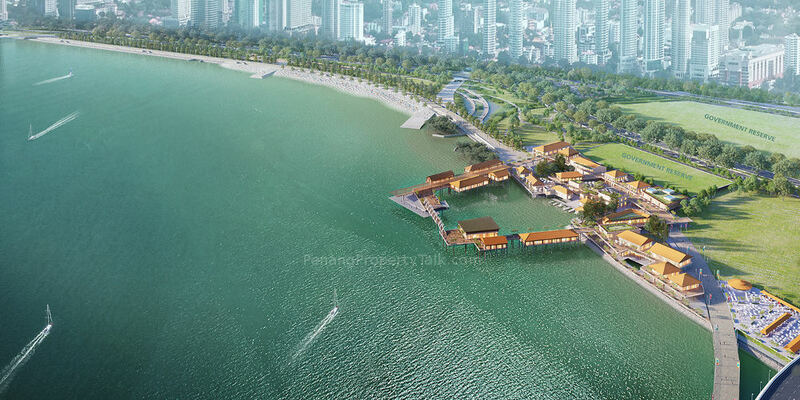 Gurney Wharf will be created on land to be reclaimed by Tanjung Pinang Development Sdn Bhd (TPD), a subsidiary of premier lifestyle property developer Eastern & Oriental Berhad (E&O). The proposed concept masterplan for Gurney Wharf was articulated through a series of curated images, photographs and illustrations displayed at a public exhiition themed “My Gurney Wharf” at a popular retail mall here. In conjunction with the exhibition, a press conference led by Penang Chief Minister Y.A.B. Lim Guan Eng together with Penang State Executive Councillor and Local Government, Traffic Management and Environment Committee Chairman YB Chow Kon Yeow was held on the same day. Also present at the press conference were State Assemblywoman for Pulau Tikus, YB Yap Soo Huey, and Member of Parliament for Bukit Bendera, YB Zairil Khir Johari. 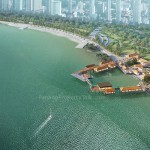 “Acknowledging the importance of Gurney Drive and the emotional attachment it brings forth in the hearts and minds of Penangites, the State is proud to propose a masterplan concept to create a new iconic waterfront destination for Penang, for the benefit of the people of Penang, and one that Penangites would be proud to call their own,” said Lim. Lim commended E&O for the Group’s initiative in engaging award-winning international consultants at its own cost to prepare the proposed masterplan concept. The consultants—GDP Architects for the overall masterplan, Grant Associates for landscaping and Jerde for retail F&B—are highly acclaimed with an impressive portfolio that includes the Aga Khan-award winning Universiti Teknologi Malaysia (GDP), Gardens by the Bay in Singapore (Grant) and Roppongi Hills, Japan (Jerde). Chow added that, “In creating this exemplar public park, we are adopting a people-centric approach to ensure that the outcome is more than just a well-designed physical space. 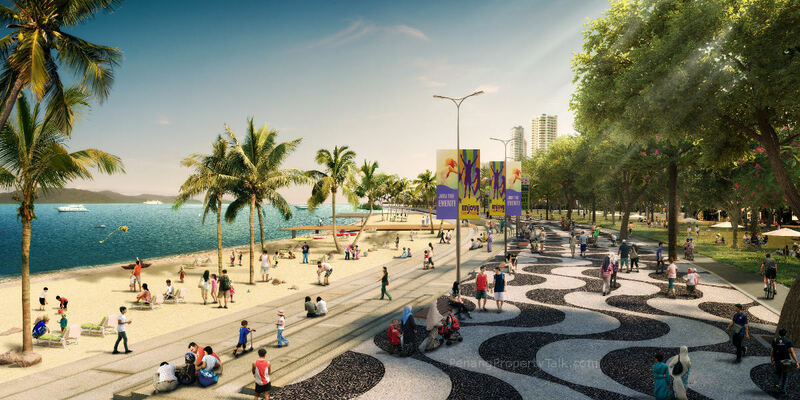 It will be where Penangites can fully enjoy the island’s sea frontage, where communities gather for wholesome outdoor activities and most importantly, where pride of place and a sense of belonging is fostered. 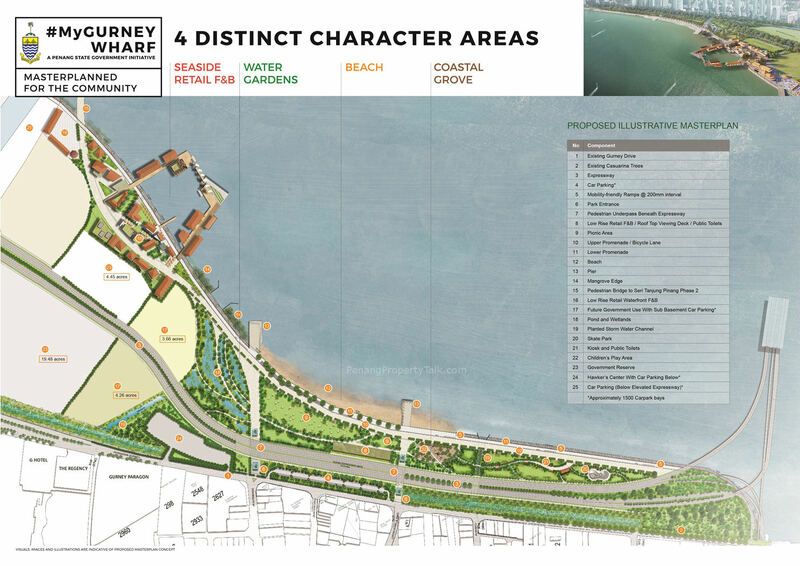 The proposed Gurney Wharf concept masterplan encompasses four distinct character areas: Seaside Retail F&B, Water Gardens, Beach and Coastal Grove. The Seaside Retail F&B celebrates Penang’s vibrant seafront brought to life by elements such as a waterfronting public promenade, seafront dining facilities including the island’s famed hawker fare and a pier walk. The Water Gardens area will be defined by lush gardens, ponds and wetlands with its most distinctive feature being landscaped water gardens with innovative storm water filtration systems. Modelled after Singapore’s success with this at Gardens on the Bay, this is a pioneering system in Malaysia which is aesthetically outstanding as it is functional. 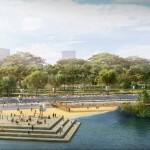 Chow said with the Beach area, Penangites would gain greater access to the waterfront area that includes a public beach as well as a public promenade. “Penangites will have access to nearly 400 meters of specially-created sandy beach which is literally, a stroll through the park,” he said. Lim rounded up by saying “In enabling easy access to the waterfront for everybody, the proposed concept masterplan incorporates two pedestrian retail underpasses with direct access from Pulau Tikus. Conveniences such as underpass lifts and escalators, separate pedestrian walkways and cycling paths as well as ramps for wheelchairs and strollers have also be included in the design. There will also be close to 1500 car park bays above and below ground level. Chow concluded by saying “The anti-climb fencing made of mesh material will be installed along the stretch of the existing Gurney Drive from the Jalan Pangkor end right up to the Gurney Drive roundabout. 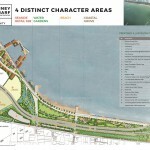 As the fencing will be secured on the far side of the existing seawall, the public will have continued access to the Gurney Drive promenade for their daily activities. As an added measure, the fencing would be installed with planter boxes to create an aesthetically comfortable public place while the mesh material ensures unhindered flow of sea breeze into Gurney Drive. wua…….lai liao lai liao. Don’t blink your eyes ya! wah lan eh, si peh sui leh! Lai huat chai ah!!!! There’s an opportunity to make this more iconic than Central Park New York. sui….sui la… kuan lu lan shu meh … lu wu share bo?? It will be AWESOME, but I reckon we should not place the hawker center right next to the sea? No offence but we all can agree that the hawkers and some people will surely put the sea’s cleanliness in stake? Seafront condo all affected. Paragon sink liau.. Government land somemore..
(1) Hawker food is the pride of Penang. It deserves the centrestage. (2) Take this opportunity to engineer human behavior. Rent out the food stalls cheaply to operators, but once they are caught violating strict cleanliness rules, they will be kicked out, then other operator can take over the stall. In other words, operators who follow strict cleanliness rules will be rewarded with cheap rent and good business (and therefore good money), and the previlage will be taken away if found to be breaking rules. Simple concept, but effective. By the way, I like to thousands of parking lots available everywhere, under the expressway, under the food court etc. Sui!! From the plan announced, there will not have any high-rise and hence no blocking of seaview to the condo there. It will in fact, enhance the value of those seafront condos as it will be “uniquely very exclusive” then on(as in Penang island). Who can 100% sure that in future no more high rise in front of it? Rule is made by human.. They can change anytime..anywhere.. Just wait &see.. In front of highway is good enough to pollute this area.. Nothing can be 100% sure in this world. You just have to learn to adapt to uncertainties, and create opportunities from it. Let me tell you, this will be a once-in-50-year opportunity. Place your bets now, or you will regret all the way into your coffin. So… stay unchanged in this area, no land development, no grow no pain, is that what you prefer? Nobody expect 100% assurance plan, everything needs the begin, no risk no gain, with challenge ahead we get hope, meet the road block then we fight…. at least, just my 2cents thought. Those Multimillionaire will be happy with the plan? Highway plan in front of condo &seaside nature environment damage affected. 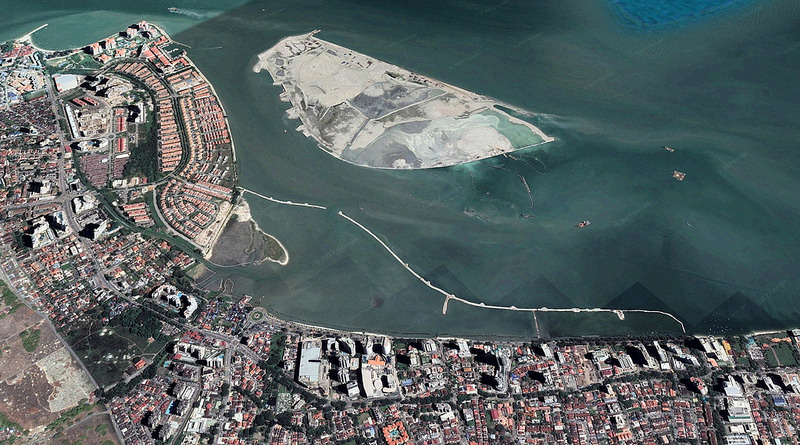 Reclaim land at Seri Tanjung pinang.. causing allthis happening. More to come. We have reserve government in front of paragon as it is part of plan.. No one will know.. What is next.. More congested to come.. Simple said, from State government perspective, if they don develop and sacrifice to overcome traffic jam again, they are the one get blamed again and sink in next election… nature environment vs development, this will be never ending debate story, but I prefer to start something than nothing. Anyhow the consideration must always come for nature environment is 1st priority. You can start something but don’t end up with dreaming& killing our nature environment. This is the effect from reclaim land of seri tanjung pinang. You can’t have the cake and eat it too. Which development in this world has zero impact on nature? It is just a balance. Look at Singapore and the speed Singapore reclaims land. Will the access road leading to the Gurney Wharf free from toll? Muddy sea to sandy beach and park.. of course want la..
loved the vast space of greenery but where is the car park or half of the greenery we see in the pictures will be turned into parking lot eventually ? Bravo to our state government. this is a great project, our next generation will appreciate this for the years to come, I mean, I really cant imagine our Gurney to remain in current state forever where we always run in overly populated and congested roads. so you prefer smelly muddy bank? prefer current disorganized traffic chaos? “more congested to come”? you must be kidding around here! The existing of entire gurney drive is congested enough RIGHT NOW and i am pretty sure this project which comes with the proposed PORR (Penang Outer Ring Road) will benefit all of us to solve the congested problem that we facing RIGHT NOW. Don’t you think so?? well, it’s nice, but if you want it to be iconic, you have to do better than those kampung houses on stilts above the water at the edge of the beach there. You have to get the best architect in Malaysia to build something that features remarkable engineering feats. Something grand, that symbolizes what the people of penang stand for and believe in. Something that would inspire. Ha Ha Ha Ha. Another big project announced, another dream. Suddenly, so many big projects announced in recent months, really can do boh ? I really like the “Artist Impression”. Ha Ha Ha Ha. 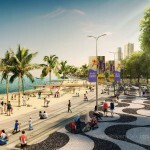 Fantastic idea.Can’t wait for it to happen.I used to morning walk along gurney drive and the mud there is horrible.State government doing a good job with such excellent proposal but its down to the people of Penang to decide.We will be catching up with our neighbour one day.Good one. Please get the people of Penang’s feedback first. Nature comes first! We do not want another huge project which kills the nature and causes climate change! We should start thinking on how we should keep the place to it’s originality instead of trying to recreate another Gardens by the Bay. That’s totally not original! Does the state take into consideration how these artificial construction will affect the island? We should stop digging the grounds and stop building more malls and F&B!! Seems like the feedback by the forumers here are very positive.. Don’t always use nature to anti establishment la.. if you think the smelly mud is so valuable, feel free to keep some before it completely gone..
ya lah everything keep, heritage area run-down shoplots keep, muddy gurney drive keep, smelly jelutong dump site keep, keep this keep that. NO NEED FOR DEVELOPMENT LOH ? NO NEED TO MOVE FORWARD? Then please throw away your handphone, ipad, TV, cars, because all these consume nature resources, and you must preserve the nature!!! I m Penang Lang. This is a very great idea I could say. Love it! The few little buildings on stilts over the water look very pathetic! How can it be iconic? Iconic means a structure/building that features amazing engineering feats that inspires! Ai yo, where got climate change, this project can help beautify the current eye sore and help smoothen the traffic flow only. The only downside is property price in penang will not be coming down, that also means for those folks who was hoping the property prices to crash, may need to wait a little longer.. but patience mesti ada, as what goes up, must come down. Keep calm. This announcement is only very preliminary, it still needs a lot of fundings to develop after reclamation. Surprisingly, some people(eg. CAP,SAM) just jumped out to protest this and that with sort of warped and twisted logic. due to fundings, more and more accusations would sure rain on the govt again…and again)))? I believe this project will benefits penang lang a lot…. Ah Chan :@Riang Anyhow the consideration must always come for nature environment is 1st priority. You can start something but don’t end up with dreaming& killing our nature environment. This is the effect from reclaim land of seri tanjung pinang. If the existing seafront full of coral or Mangrove. then i agree should keep nature environment.. but that place now no value at all now… Fish oso don’t want to swim in that area.. i don’t think it will impact a lot to recreate it so Penang Kia can enjoy the good place for relax… hope make sense.. The 8 lanes highway kena toll or not? If kena toll, then only the privileged can enjoy the park…. If kena toll, park at Kalawi and walk there… short walk anyway. Next East Coast Park in the making. If one knows the history of East Coast Park Singapore, the piece of land is reclaim land and today this greenery Park is one of the popular site for East Singaporeans to go to. One of the reason why many expats like to stay near there at Marine Parade is due to the close proximity to East Coast Park. And property prices around that area is doing very well for surburb area. transportations and government of the day. Ya, dont be self pity, many see Penang as a blessed place to live in, i myself would not choose to live in a place where water is short and chewing gum is forbidden, oh ya, forgot to mention, singaporean are migrating else where when they earn enough cos they dont see sg as a good place to grow old with. You just have to “eat” up your word. Optimistic failed to exist in Malaysia. You have learned this word only from a book. Agree,we are far behind Singapore in all departments but at least our Pg government is trying to be closer to them.Whats the problem. The problem arises when someone tries to promote and rationalised. Self praise is no praise. Yes, you have chosen a blessed country with corruptions. Don’t forget there are many Malaysians who work in the Singapore government sectors. To be success or not its all depend on the leader of government. Singapore former PM Mr. Lee previously had remarked as surprised to see Penang basically no change as compare to his last visit Penang 20+ years ago…..
Penang government is slowly catching up and make changes as late is better than never. I think Penang government should straight away implement good projects which benefit to Penangites rather than waiting for the feed back and so on ….which is a waste of time. Great idea…more greenery to gurney…add value to the property there in the long term…. As long as they don’t build new apartments/condominiums but instead improve the traffic conditions in Gurney, then no concern from majority of the Penangnites. Excellent idea. we will have more greens, park, playground, cycling lanes etc in place of current mud,muddy surface, stench of rubbish and mudskippers..
Good works..! New image for Gurney and Penang in the future..Be positive and optimistic ..and let Penang be a garden city one day..! Our sons and children will benefit from these.. Wish it starts as soon as possible. Locals and foreigners are fed up with all those mud scene. I still remember the good old time walking along the Gurney having nice hawker food and able to walk on the beach too. Please bring it back with better shape!! The reserved land earmarked by the state government is actually reserved for of Ewein build more buildings. Please check the wellness city of dreams page. I guess the state didnt come clean on this issue. only a fraction of the land will be reserved for a parl. How abt the reserved land next to Tamarind? A reclamation to solve the past 8 years drainage failure at Gurney Drive……Nothing spectacular! Ya, nothing spectacular, but what is? Out of international standard, cannot match other world city wharf…….A hospital will be build in the front end for wellness, rehabilitation & recovery. I think better change the whole sketch to Medical City, can help Penangites generate extra income. Which international wharf? Name? Given u the choice, u would choose to be their citizen? But do u think u will be treated as one of their kind? Or someone who deemed inferior to them? I see no point we keep on playing the self pity tune and sing praise to others. This attitude will only weaken one nation in long run. See to it as a parent who keep telling to their own children that they are nobody,,, and sure enough, the children will be ended up as u know how! And if you are a parent, please dont discourage them but give them support instead. Internatianal standard? Plaese go to Karpal Singh Drive and count how many tikus hide in between. Wake up from your day dream, study the plan carefully. It’s actually half public park and half wellness centre. The wellness centre is situated just in front of the IJM roundabout! Such harsh bashing even when a good project is carried out. Which international wharf you been dreaming for? No strong comment lah, just small feedback & minor talk only. I support & dream of competency, accountability, transparency. Just not so happy as the medi component was not shown in Komtar & Gurney Plaza. Project wise, I agreed with you……it’s a good project. I passed by Gurney Drive everyday. Fence very decorative…….achieved international standard. Nice & speedy works from the contractor……achieved international safety standard as well. Actually the current gurney drive’s condition is terrible….other than the sea front, there is nothing else left. Fresh sea breeze? Smelly; beautiful scenery? Muddy yucky zone; Recreational? Only Foreign workers and some local malays spending their days there. As a Penangite whom love the environment, I dare not bring my friends to walk there anymore….. Therefore, this is a good try for the State Government to rejuvenate Gurney Drive. After the concept done, what is next? Enforcement and Maintenance! Funding wise, I think E&O will funds it if not mistaken, as to exchange for STP2 reclaimation (pls correct me if I am wrong). Is it the Gurney Wharf and STP2 reclaimation on the same time? Who is paying to build all this?? I don’t trust E&O involvement… suspect they might have a deal behind-the-curtain to later build a cluster of high-density condos like Andaman at Quayside. The small buildings protruding into the sea are really a sore to the eyes. The legs of the buildings could get eroded over time and accumulate nasty looking sea slimes and parasitic sea creatures. Somemore If hawkers are allowed by the sea, can imagine this Gurney Wharf is just going to end up like the old esplanade (padang kota lama) hawker centre, which is dirty, smelly, and the sea is seriously polluted. Will be nice if those small.buildings are not going to be built there, and no hawker activity is allowed there. Just reserved the land as a greenery park. Since the project in the early stage, propose to include 6 lanes for International Dragon Race, this will further enhance Penang water sport activities, curently the race at Telok Bahang Dam, not very well eqiup and less attractive to internatinal team to come forward and local’s team as well, this will frther improve penang water sport activities.